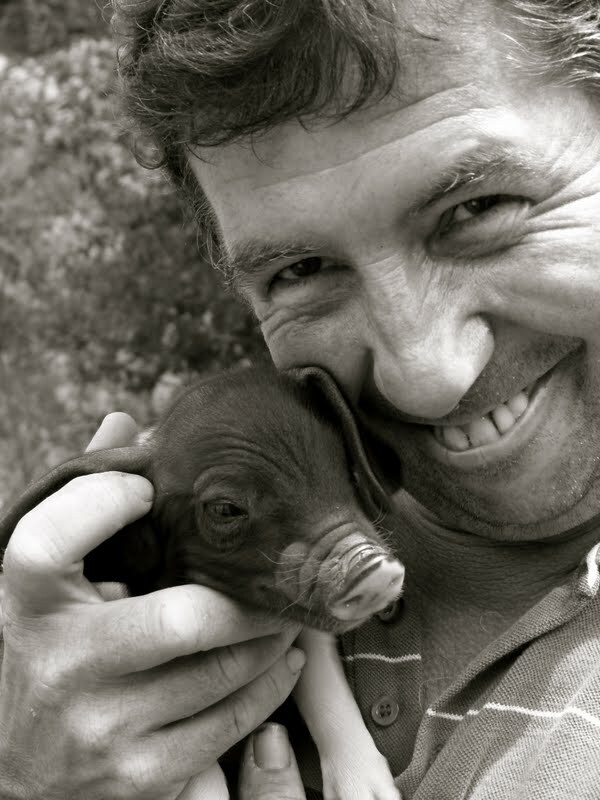 Andre Eyhéramendy from Pagolle in the Basque Country is a man who adores his pigs and you have to visit the farm to know just why. They are not just sleek and handsome but they are also affectionate, tactile and almost give kisses. Jean Francois bumped into Andre a few months ago on a trip to Alain Domini to collect our monthly yoghurts. Andre was there to collect petit lait or milk curds for his newly-born baby, piglet family and they both got talking and since then Jean Francois has been insisting that we visit his large family. 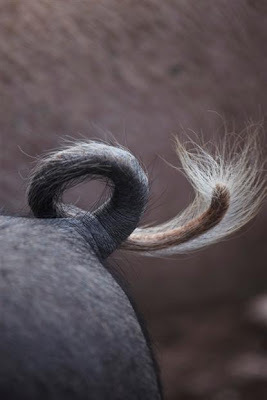 The black basque pig or Pie Noir or Euskal Herria are the true pig of the western pyrenees and more precisely the hidden valleys of the basque mountains. They live on the higher pastures on steep inclines that a human would slip and slide on but they are true mountain men and love the high, flowery fields in the summer months and in late August, once the acorns fall from the oaks, spend their days snuffling through the forests gobbling up their fruits and then in September they have the chestnuts to plump them up for the cold winter months. Andre feels just the same way. When we arrived to see him, we were first introduced to the five dogs, the sheep who has just given birth to twins and the wild, prolific plum tree. Further up on the hills we could see the bigger and older pigs on the steep pastures where they while away their mornings. The younger pigs stayed together lower on the slopes and as we walked uphill they came rushing down in droves as if there was a big bear chasing them. Andre explained that it was midday and time for the midday mud bath. 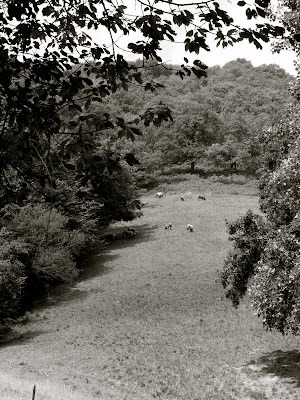 As we sat on the upper hill, the older and wiser clan, lumbered down to the stream and splashed around until well coated in mud before making their way to the canopy of trees to take siestas. The older mothers lazed alone while Andre massaged Gaxuco's well worn abdomen and the younger crowd just snuffled together. 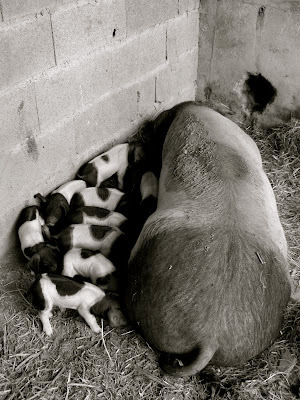 (Andre has just announced that Gaxuco has given birth to 8 sprightly piggies in the last 24 hours). One of the ladies had given birth to 15 pink shiny and spotted piglets and she was proud to show off her brood.